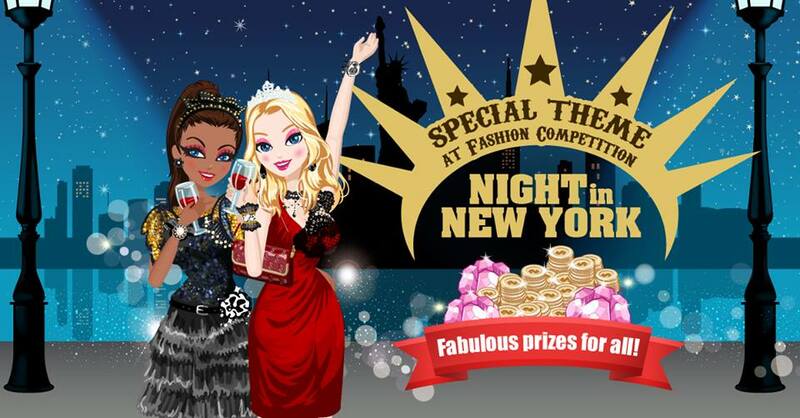 Become the queen of Queens, shine the brightest in Time Square, and enjoy a Night in New York! Enjoy fabulous prizes and become the center of attention this Independence Day at the Empire State! Calling all #StarGirls! The Daily Competition is now live! Go for gold in the new Athletic Aesthetic Competition! 🏅 🏅 🏅 Do you have what it takes? A Star Girl is always ready for any Mysterious Encounter. Are you? Our prizes have gotten an upgrade so you better be! It’s a good time to get your Halloween costume together because items are 25% off on Star Wow! Summer just got even more exciting with a long list of promos and events that you can’t miss! Start it all off with a book-worthy romance as we introduce a few dashing men to our world! Get to meet them on Star Girl Classic! Lace up your shoes and tighten your ponytails for our Summer Sports Extravaganza! 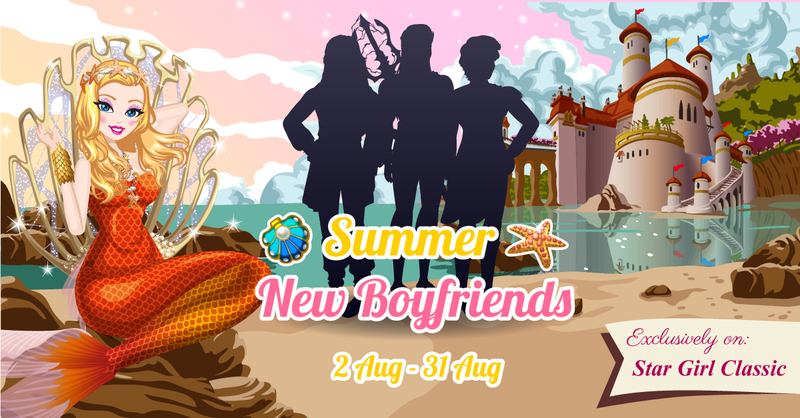 Get these fabulous new items from 5 Aug- 21 Aug on Star Girl Classic, Star Girl Beauty Queen, and Star Girl Princess Gala. Just ‘cause you’re working up a sweat doesn’t mean you can’t be fab, amiright? You get all that and there are more to come. It’s gonna be the best summer yet! Stay posted and follow us on all of our social media! 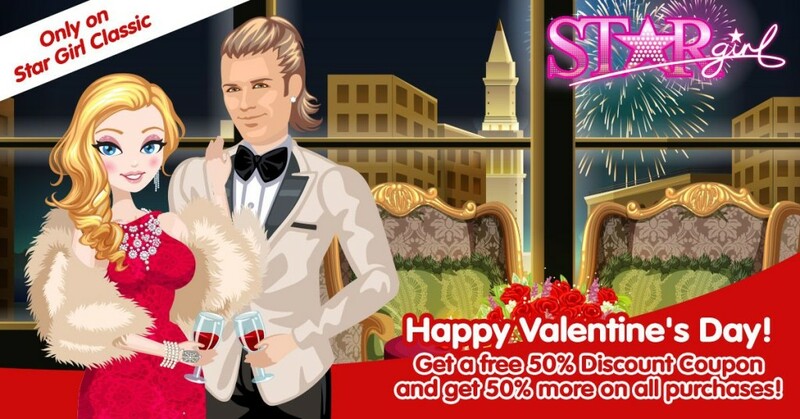 Star Girl Valentine’s Event Fill February with lots of Love, Promos, and Surprises! Right after celebrating the arrival of this Monkey year, we shall begin our Star Girl Valentine’s Event! Starting with adding more items for you to grab as we launch a new wardrobe collection just in time for you to prep for Valentine’s Day! Keep an eye out for it! It’s gonna be sweet! It doesn’t end there! We love Valentine’s so much that we will be giving you a FREE 50% Discount Coupon plus 50% more on all purchases of Diamonds and Coins. Love’s not the only thing that’s gonna be in the air with all the discounts and promos you’re getting! We have tons of other surprises for you these next couple of weeks so stay updated by following us on Facebook, Twitter, and Instagram! It’s gonna be a fun, fierce, and fabulous February, girls! 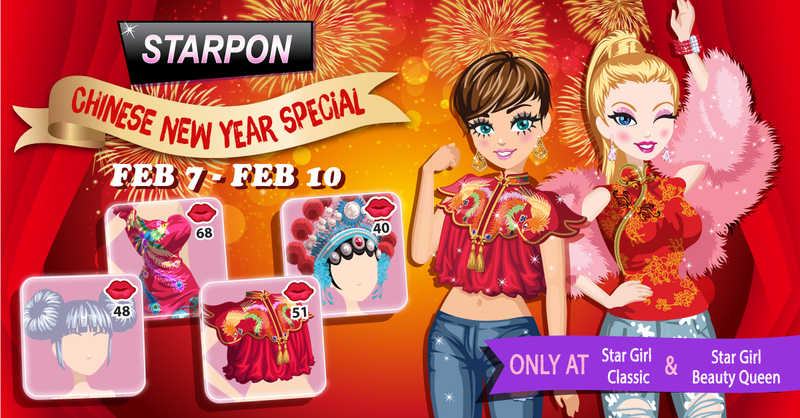 Star Girl Celebrates Chinese New Year with Fantastic New Starpon Promo! Brace yourselves, girls, ‘cause we’ve got a lot in store for you this year. And it all starts this February! Gong Xi Fa Cai! Star Girl celebrates the Lunar New Year with some amazing items up for grabs on Starpon. Available at Star Girl Classic and Star Girl Beauty Queen, this promo will run from Feb 7- Feb 10, 2016. Don’t miss out! Star Girl Black Friday Special! Who doesn’t love Black Friday? This weekend (Nov 26 to Nov 30), Star Girl Classic users will get a free 50% discount coupon, plus a “buy one, get 50% more” sale on all IAP! 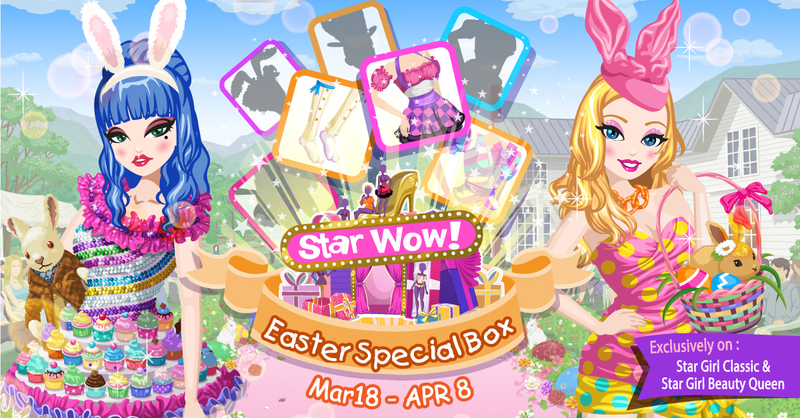 We are also giving away Starpon items at 90% OFF on Star Girl Classic and Star Girl Beauty Queen! Now is your chance to get that dress you’ve always wanted, so don’t miss out! Celebrate Singles Day with Star Girl! Did you know that 11/11 is “Singles Day” in China? To celebrate, Star Girl (Classic version) is offering a massive discount in the Paris Hilton Collection, to all Star Girl players everywhere! You can now buy 7 exclusive items for only USD 0.99 (original price 4.99)! This discount is only available on 11/11, so don’t miss out on this amazing deal!